When you consider a list of essential kitchen tools, a meat slicer might not be the first to come to mind; however, investing in one of these can save you a considerable amount of time and money. Our top pick that we think would be suitable for most home users is the Chef’s Choice 615A Electric Food and Meat Slicer. It’s well built and can produce a wide variety of thicknesses in different food types. On top of that, it’s the easiest model we’ve seen when it comes to cleaning – and who doesn’t love a speedy cleanup? You won’t need to pay extra for pre-sliced deli meats (or things like cheeses), and you can also dictate the quality and ingredients of your chosen meat, rather than buying heavily preserved pre-sliced deli meats that may be full of chemicals. Using the slicer to chop up bulk food items like a big side of meat or a bucket of veggies also saves you a lot of time and effort. In this guide, we will look at and compare some of the best meat slicer models on the market for home use in our meat slicer reviews and comparisons. Why Buy A Meat Slicer? 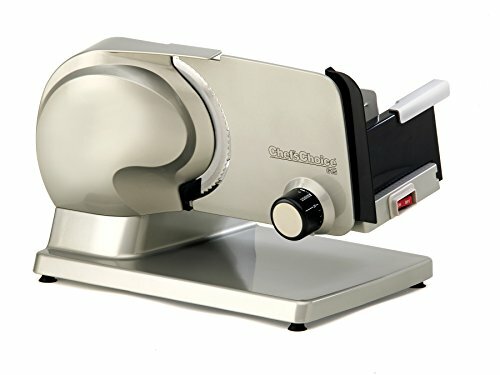 Chef’s Choice meat slicer offers great performance while being easy to clean. While it’s much easier to clean this slicer than many of its contemporaries, it’s not dishwasher safe. Unlike some other models listed, the Chef’s Choice 615A is a cinch to take apart and reassemble for easy cleaning – it should take you only around five minutes to disassemble all the parts and give them a wash. When using the slicer, varying the amount of pressure you use on the meat will yield slices of different thicknesses. If slicing deli meats perfectly thin is your thing, you’ll have to be very careful as you feed meat into the blade. Although you may be hard-pressed to get really paper-thin slices of meat, you will get pretty close, and the consistency of the slices is good. If you’re after thicker slices, it can go up to ¾ inch. We appreciate the attention to safety with this unit; it has a slider lock which locks the slider over the blade when you’re not using it – a feature that not all meat slicers offer. If you have a large roast that you need to slice, the Chef’s Choice 615A can handle it; the food carriage is generous and can fully retract to fit those bigger chunks of meat. The blade in this model is serrated, as with all our reviewed non-commercial meat slicers (the only two on this list with non-serrated blades are the BESWOOD And Best Choice slicers. Serrated blades aren’t a huge drawback and most people are perfectly happy using them, but if you are a perfectionist, a smooth blade offers just a little bit more precision. Overall, this is a great meat slicer that would suit most households. Built from cast aluminum and stainless steel, it is good quality and will handle most of your slicing jobs with ease. The BELLA meat slicer offers the bare minimum necessary for home use. It’s loud, easy to adjust, and cuts through meats and cheese using a serrated blade without very much pressure required. With a bit of care and attention, you can make even slices for party trays, cold cuts, or other culinary purposes. The BELLA is not without its downsides. While most home slicers are hard to clean, this one is exceptionally difficult. There are more crevices and gaps in the machine than you could shake a stick of salami at. Anything you slice will work its way into all of them. Cleaning the device fully may take significantly longer than slicing a cut of meat. While you’re slicing, the BELLA doesn’t deposit meat in a sensible place. There’s no tray or catch or anything else. It might be reasonable to expect the slice of meat itself to fall onto a cutting board, but the BELLA leaks juices and scraps all over your counter while it works. Consider placing it in a pan to minimize this dripping and set up a tray to collect the slices as they fall. The Continental deli slicer is easier to clean than the BELLA and cuts pretty evenly. It can cut different types of cheese, bread, and other tough items without much fuss. The Continental slicer is not fast. It’s far faster than going by hand, of course, but if you feed it cheese or even a tough cut of meat, the serrated blade will slow down and you’ll have to slow down your feeding speed to match. While the cuts are even enough, it suffers from the same issue as the Chef’s Choice; if you feed meat with too much pressure, you’ll get thicker slices than you bargained for. It’s also rather noisy – if you want to slice in the morning without waking anyone else up, forget it. Finally, for raw meats especially, it has a habit of dripping juice everywhere. This is fixable with a bit of foil to cover a small gap below the slicer, but it’s a bit weird that the foil might be necessary. 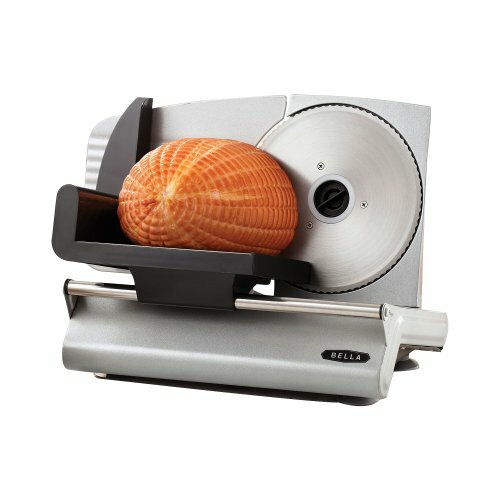 If you’re not concerned with going a bit slower than some of the other slicers we mention, we think the Continental meat slicer is a budget-friendly option to consider. This unit is marketed as more of a commercial food slicer but will do a great job in your home kitchen too. Because it’s designed for more of a professional level of slicing, the price tag does rocket considerably – but the quality matches. The BESWOOD food slicer is bigger and heavier than the three models listed above, so you’ll need to ensure you have enough bench space and/or storage space to accommodate it. As you’d expect, the parts are well constructed; you won’t find any cheap plastic components in this model. The blade itself is chromium-plated steel with added protection against rust. They’ve also added noise and vibration reduction to make it more comfortable and pleasant to operate. 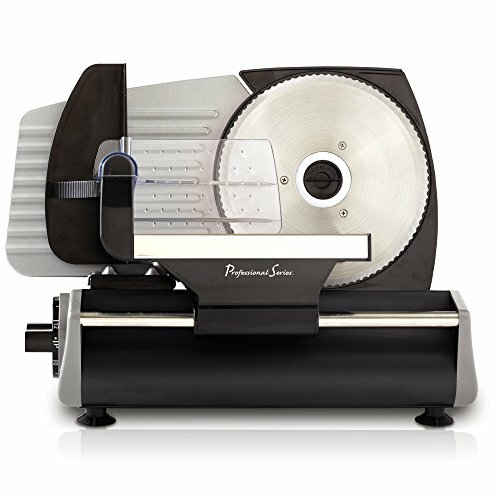 Unlike the three models above, this food slicer has a non-serrated blade, which is capable of producing paper thin, uniform slices. It’s razor sharp and kept that way by an in-built sharpening system which keeps it honed. The downside with a solid, commercial-style machine like this is the added complexity of cleaning. Although it’s not a huge task, it will still take longer than smaller models like the Chef’s Choice. You must clean it after every use, as food gets trapped behind the blade. To clean well, you’ll need to take it fully apart. Because the blade is held in place with screws, this can be a bit fiddly. That’s really the only downside of this heavy-duty food slicer. 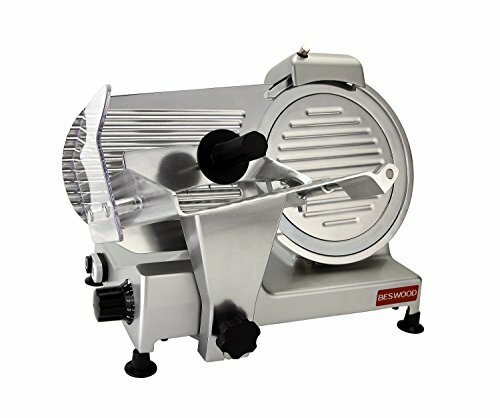 If you’re looking for something to use regularly, and are willing to pay extra for a powerful, durable, quality slicer, consider the BESWOOD. The other slicers we’ve reviewed use a 7″ blade while this commercial food slicer has a 10” blade. This is a pretty big step up. Like the BESWOOD, the blade is non-serrated. It has some major differences from a consumer grade slicer. While it disassembles, you’ll need a screwdriver to take the blade off if you want to clean around it. You shouldn’t need to do this often, but it’s something worth noting. While you’ll need a screwdriver and a wrench to fully clean the unit, the actual cleaning process is comparable to most of the slicers above. To be clear, this machine slices much more quickly, quietly, and evenly than anything else on our list. The blade won’t slow down at all when you feed it a tough cut or some cheese. Since it’s made of solid metal, you can’t bend anything as you feed things in and vary your slice thickness. The instruction manual is total rubbish and you should probably have a good working knowledge of slicers before considering this unit. You’ll find more useful information from a competitor’s manual or an internet video. By slicing your own meats, cheese, vegetables, and bread at home you may end up saving money by slicing cheaper cuts of meat and food that you prepared yourself. Many deli meats are boiled concoctions with preservatives and additives, so it allows you to take control of the quality of foods you slice. Besides, deli meat can’t compare to slicing up last night’s roast. How often do you plan to use the tool? If you only use it once a year, it will take a long time to pay for itself. How much storage space do you have? Most meat slicers need a decent amount of real estate, either on the counter or in the cupboard. How much weight can you handle easily? These machines are not light! Meat slicers come in two varieties. Automatic meat slicers feature an automatic carrier or platform to move food into the blade. Manual food slicers require the operator to move the carrier back and forth. ​ This also means fingers are much closer to the action. For home users, an automatic slicer is a little bit of an overkill. In fact, many deli clerks slice meat to order without using automatic features. Another reason to consider a manual version is price and safety. Of course, more electronics and gears increase the price, but also potential dangers such as jams and binds, which could potentially cause a fire or ruin the motor. 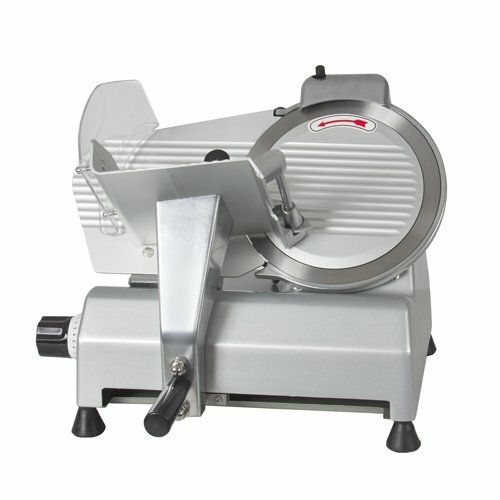 Meat slicer blades are made of either hardened stainless steel or surgical stainless steel. This helps protect them from corrosion and dulling prematurely. They typically have sharpeners built in, close to the guard, so that the blade doesn’t have to be manually sharpened. For added safety, recessed power switches are usually far from the blade area. The blades in a new meat slicer will be sharp and will cut whatever gets put in their way. Many also feature a blade guard that makes it difficult for fingers to accidentally get in the way of the blade. Many manufacturers of meat slicers strongly recommend the use of stainless steel mesh gloves (such as Anself Cut Resistant Gloves) to protect the user from the spinning blade of the meat slicer. While these gloves can be expensive, they are cheaper than a trip to the emergency room and may save you a finger. Your meat slicer should offer a guide release for releasing any jams, a thickness adjustment knob to customize your cuts, and non-slip feet to keep the slicer stable. While these features are in place to help protect you, the operator, you will still need to use caution and not try to force anything. ​ Many accidents include severing fingers, which we believe is preventable with patience and utilizing safety features and tools such as mesh gloves. The meat slicer body should be easy to open for the partial disassembly needed to thoroughly clean the slicer. Shoppers should look for meat slicers with NSF certification. This certification indicates that the machine has fewer seams in the casing and should be easier to clean. Other features designed for safe use include a built-in food tray to catch sliced meat as it exits the blade and a cool running motor. A meat slicer is a great addition to a busy household with lots of food prep work to take care of every day. The Chef’s Choice 615A Electric Food and Meat Slicer is our favorite model for home use. It’s compact enough to fit in most kitchen areas and produces a good variety of thicknesses that should suit both heavy and light use. Investing in a machine that can take the strain off your wrist and elbows with non-stop slicing – as well as give you perfect slices every time – is a great idea. Not to mention the money you can save on buying pre-sliced meat.